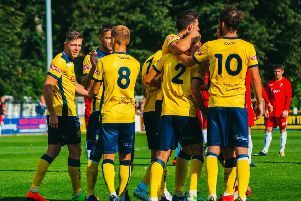 Andy Gascoigne’s goal on the stroke of half time was enough to give Town a welcome victory at fifth place Solihull Moors. Town, who were playing in the white shirts of three seasons ago because of a colour clash, were unchanged from the side that defeated Boston. An even first quarter saw Paul Clayton firing over the top for Town and Moors keeper Tony Breeden turning a Ryan Fallowfield cross for a corner. The prolific Omar Bogle was left in the clear after a Lewis Turner mistake, but the former Leeds United defender redeemed the situation with a fine covering tackle. The industry of Jack Emmett, Cecil Nyomi and Jordan Thewlis provided ammunition for Town’s strikforce, but the final crosses were easily cut out by Breeden. On 25 minutes Town were dealt a blow when Luke Shields had to leave the field after a collision with Bogle and Adam Nowakowski took his place. The Moors were creating some good chances and a Darren Byfield cross was cleverly backheeled to Bogle by Ryan Beswick but Crook was equal to the striker’s shot. Although Bogle then went close with a couple of low drives, it was Town who broke the deadlock. Thewlis cut in from the left and Breeden could only parry his vicious drive into the path of Andy Gascoigne who made no mistake with his follow up. On 46 minutes an incisive pass inside the full back by Clayton allowed Thewlis to score but the linesman’s flag was already raised for offside. <Moments later Thewlis returned the compliment by finding Clayton unmarked but his weak shot from close range was smothered by Breeden. Dom Rowe replaced Thewlis with 20 minutes left as Simon Weaver sought to use his speed against a tiring defence but it was Moors who began to dominate. A foul by Nyoni on Reece Fleet on the edge of the area gave Town cause for concern, but Knights ballooned the free kick well over the bar. Crook, hero of the hour in last week’s win over Boston United, then pulled off a brilliant double save from Bogle and sub Stefan Moore to keep Town ahead. Moors pushed captain Liam Daly forward in a last attempt to salvage a point and deep into stoppage time they were awarded a free kick. But Clayton, who had done a magnificent job leading the Town line, got back to head away the danger.